That’s the idea behind Ice Cream Day, a promotion launched by Uber Technologies in 2012. The ride-share giant courts customers by allowing them, for one day each summer, to arrange instant dessert delivery through the Uber app. But in June 2015, as the American powerhouse expanded that campaign across 53 countries, Malaysian entrepreneur Anthony Tan saw a chance to cast Uber as an outsider—and burnish the appeal of his homegrown ride-hailing venture, Grab. Just after Uber’s event, Grab offered what Malaysians really scream for: smelly durians. Customers in Kuala Lumpur, the capital, could have one of the pungent fruits rushed to their doorstep by a Grab driver. To deliver on that promise, Grab had to devise special packaging: Durians, though considered a great delicacy, emit an odor so overpowering that they are banned in many airports and hotels. Grab surmounted that obstacle and offered the fruits at the bargain price of a single ringgit (24¢). They sold out almost immediately, and the “GrabDurian” marketing coup is now well into its fourth year. “No foreigner would have thought to do that,” chortles Tan. Uber, he says, “couldn’t fully appreciate how local you needed to go” to win in Southeast Asia. Grab has employed hyperlocal strategies with remarkable success. 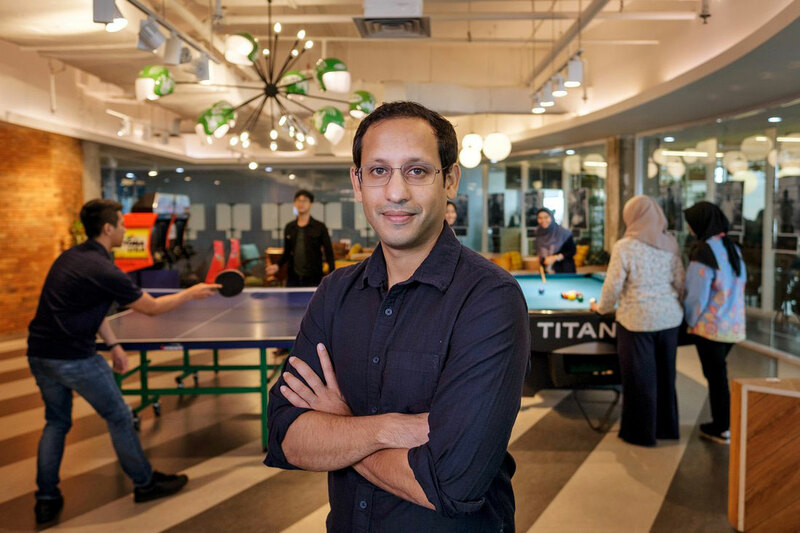 Since its 2012 launch from a warehouse closet in a gritty Kuala Lumpur suburb, the venture has expanded to eight countries. It boasts 2.8 million drivers—more than the 2 million claimed by Uber. Grab says its app has been downloaded to 139 million devices and that it processes more than 6 million ride orders a day. Grab’s 2018 revenue topped $1 billion, and it expects to double that figure this year. Along the way, it outlasted its ice-cream-peddling rival: In March 2018, Uber announced that it would sell its Southeast Asian operations to Grab in exchange for a 27.5% stake in the company and a seat on its board. Tan, 37, and cofounder Hooi Ling Tan (a 35-year-old fellow Malaysian to whom Anthony is not related) have aspirations stretching far beyond the taxi business. They aim to transform Grab into an “everyday super-app” that engages consumers on multiple fronts—offering food delivery, digital payments, financial services, and even health care along with rides. Most of the region’s 650 million consumers are only now getting access to conveniences long taken for granted in China and the West; Grab hopes to be the app that connects them to whatever goods and services they demand. With a 2017 GDP of $2.8 trillion, Southeast Asia, were it a single country, would be the world’s seventh largest economy; at its current growth rate, it would rank No. 4 by 2030. But for investors, market size is only part of the appeal. Super-apps promise a new mode of connecting with customers and an opportunity to amass a vast data trove about their preferences and purchasing behavior. It’s a model pioneered in China by Alibaba’s Alipay and Tencent’s WeChat; Mark Zuckerberg, in a recent blog post, hinted that he hopes Facebook can emulate it. Many believe revenue from super-app services and the data they generate will prove to be more stable, more profitable, and easier to scale than revenues from ride-hailing—where profits have been elusive even as growth skyrockets. In Southeast Asia, the super-app model is evolving more rapidly than anywhere else in the world. That helps explain why Grab has raised $8.6 billion in venture funding from powerful players including Japan’s SoftBank Group and Toyota Motor, Chinese ride-hailing giant Didi Chuxing, and Microsoft. Grab’s most recent funding round values it at more than $14 billion, making Grab Southeast Asia’s most valuable unicorn. But in Grab’s latest battle, it doesn’t hold home-court advantage. Grab has moved its headquarters to Singapore, but Anthony Tan has recently been spending more than 70% of his time in Indonesia. Many analysts believe that winning there is crucial to establishing regional digital hegemony. Indonesia accounts for 40% of Southeast Asia’s GDP, and it boasts unusually tech-savvy consumers: 74% of Indonesians with mobile Internet access make e-commerce purchases, the highest figure in the world, according to social media management platform HootSuite. Here’s the rub: Across the archipelago, Grab’s drivers must vie for passengers with rivals from Go-Jek, an Indonesian venture whose backers include Google and Tencent. Go-Jek employs more than a million drivers and processes more than 100 million transactions for 25 million monthly users. Go-Jek is also a super-app: The venture’s 18 on-demand services include Go-Mart (grocery shopping), Go-Clean (housecleaning), Go-Glam (hairstyling and makeovers), and Go-¬Massage (self-explanatory). Go-Jek claims 108 million app downloads and says at least half of those who have used its app have also used its payment service, Go-Pay. The exchange hints at the personal acrimony that has crept into the rivalry between Makarim and the Tans. It’s a contempt rooted in familiarity: All three were classmates at Harvard Business School, and they once considered one another kindred spirits. Until recently, Grab and Go-Jek mostly stayed out of each other’s lanes. Now, as their business models and target markets converge, the two seem to be on a collision course. In many cities, the companies have embarked on a no-holds-barred price war, slashing fees for car rides, motorcycle trips, and other services. The conflict can be visually bewildering. In Indonesia, both ventures have adopted green as their corporate color, with Grab’s drivers clad in forest and Go-Jek’s decked in a shade of kelly verging on lime. In Jakarta, the combined fleets have transformed major thoroughfares into pulsing rivers of green. For now, Grab is the front-runner. It operates in more markets than Go-Jek and holds e-payment licenses in the region’s six largest markets. (Go-Jek offers such services only in Indonesia and the Philippines.) With its Uber acquisition, Grab has the ride-hailing market-share lead in Singapore, Malaysia, the Philippines, and Vietnam, though Go-Jek competes in each. Even in Indonesia itself, Grab holds 62% of the ride-share market, according to ABI Research, although Go-Jek disputes that figure. This battle arguably began in a classroom at Harvard. There, in the spring of 2011, the Tans and Makarim enrolled in “Businesses at the Base of the Pyramid” (also known as “B-BoP”), taught by senior lecturer Michael Chu. The course takes its name from a thesis popularized by business scholars C.K. Prahalad and Stuart L. Hart, who argued that the biggest opportunities in emerging markets lay not in catering to the affluent but in serving the billions of aspiring poor joining the market economy for the first time. Hooi Ling Tan and Makarim were friends before coming to Harvard. Both had worked as consultants at McKinsey, she in Kuala Lumpur and he in Jakarta. Neither knew Anthony, but both knew of him—the gregarious youngest son of Tan Heng Chew, one of Malaysia’s most prominent industrialists. All three shared a frustration with the failings of their home countries’ transportation systems. For Hooi Ling, a self-described “gadget freak” with a degree in mechanical engineering, the main defect was safety. In her teen years, Kuala Lumpur’s taxis were considered so unreliable that, even to meet friends at the mall, she had to be driven by a family member. During her ¬McKinsey stint, her mother, a stockbroker, would wait up well past midnight to monitor her return home. In the end, the logic of the opportunity prevailed. Hooi Ling and Anthony teamed up to enter HBS’s annual business plan contest with a proposal for an app-based taxi-hailing service tailored to Southeast Asia. They came in second, earning $25,000—enough seed money to launch a venture they called MyTeksi. Grab and Go-Jek position themselves as “super-apps,” wooing customers in fields far beyond the taxi business. Here are some other industries in which they compete head-to-head. Both Grab and Go-Jek hope to borrow a page from China’s Alipay and WeChat apps, whose “digital wallets” can be used to pay for just about everything. GrabPay operates in six Southeast Asian nations—and could go wider with help from a new prepaid-card partnership with Mastercard. Through Grab Financial Services, Grab offers loans to local consumers and entrepreneurs who otherwise have no bank accounts, using their digital-payment histories to help establish creditworthiness. Go-Jek’s Go-Pay system currently operates mostly in Indonesia; the company says it’s on pace to process well over $6 billion worth of transactions this year. After Go-Jek launched its app in 2015, GoFood quickly became one of its most popular menu options. Founder Nadiem Makarim originally saw prepared-food delivery as a way to keep drivers busy during off-peak hours. But it’s now a sales driver in its own right, processing more than $2 billion worth of food deliveries a year. Go-Jek users can also order groceries through Go-Mart. The GrabFood restaurant-delivery service expanded dramatically in early 2018, when Grab bought the Southeast Asian operations of Uber—including UberEats. Grocery delivery joined the portfolio in August, when Grab launched GrabFresh in partnership with Malaysian delivery service HappyFresh. 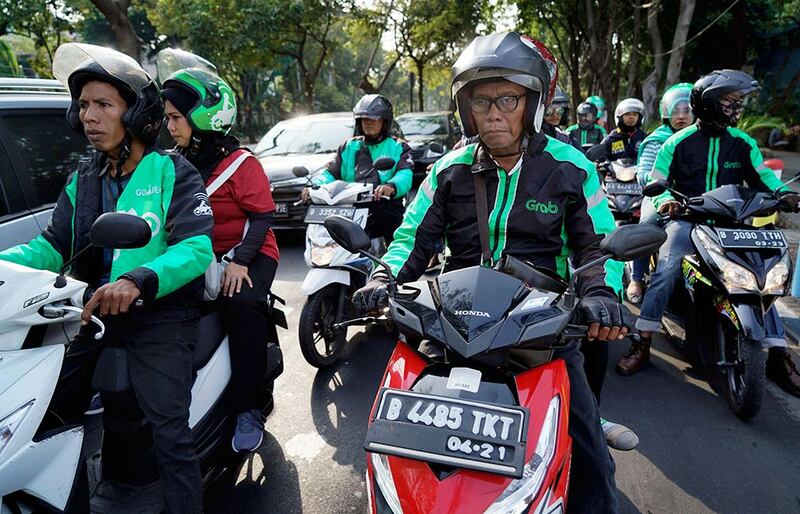 To combat the epic gridlock in Jakarta and other Indonesian cities, Go-Jek has deployed its motorcycle-taxi fleet to bring ondemand services to its customers, with options including GoClean (housekeeping), Go-Glam (hairstyling and makeovers), and even Go-Massage. There’s no GrabDrug or GrabDoctor—at least not yet—but Grab in August announced a joint venture with China’s Ping An Healthcare and Technology to explore delivering medical consultations via app, along with medicine delivery and appointment booking. By Makarim’s own admission, ojeks were an imperfect solution. “They were never around when you needed them,” he recalls, and their reputation for haggling led many passengers to disdain them. Still, he saw them as an untapped resource that, if professionalized, might alleviate everyone’s least favorite thing about Jakarta. Makarim recruited 20 ojeks and a couple of dispatchers—and bought everyone green jackets. Grab’s first venture investor was Anthony Tan’s mother, who confessed she didn’t understand his business model but hoped it would succeed because his father—who had already turned Anthony down—was threatening to disinherit him from the family’s considerable fortune. By late 2014, MyTeksi had amassed more than $80 million and had expanded to the Philippines, Singapore, Thailand, and Vietnam under a new brand, GrabTaxi. But its burn rate was high, as the Tans offered aggressive promotions for drivers and discounts for passengers. SoftBank reportedly invested $250 million in GrabTaxi, for a stake whose size neither company has disclosed. So far, for both Tan and Son, that investment has proved good indeed. SoftBank has led several more fundraising rounds for Grab, most recently for $1.46 billion in early March. And Son, who also is a major shareholder in Uber, played a decisive role in persuading that company to sell out to Grab. Son’s investment initially sounded like bad news for Go-Jek. But global investors were beginning to scramble for opportunities to invest in the ride-hailing model outside the U.S., and Son’s Grab stake only fed the frenzy. Makarim offered these investors a new angle: a super-app model. The omnibus sensibility helped Go-Jek break through. In October 2015 it won funding from Singapore’s NSI Ventures and Sequoia Capital. In 2016 it raised $550 million in a round led by private equity firms KKR and Warburg Pincus, vaulting Go-Jek into the unicorn club. By the time Grab joined the super-app battle, rolling out the payment platform GrabPay late in 2017, both companies had plenty of financial ammunition for the fight. Like gunpowder, pasta, and paper money, the super-app is an innovation generally credited to China. Among the earliest incarnations was Alipay, the payment function created by Alibaba in 2004 in tandem with its Taobao e-commerce platform. Alipay has evolved into China’s dominant mobile-payment method, a digital wallet linked to bank accounts and credit cards and used to pay bills, transfer money to friends, book a hotel—or do just about anything else. Even more versatile is WeChat, launched by Tencent Holdings in 2011. WeChat was originally designed to exchange text messages and photos, but Tencent added an Alipay-like digital wallet function, along with a host of social features to make the app quicker, quirkier, and stickier. For the tech giants who run them, China’s super-apps are a data El Dorado. Unlike in the U.S., where Google, Facebook, Amazon, and other tech leaders wrangle and squabble over disparate streams of data reflecting different aspects of consumer behavior, Alibaba and Tencent hoover up information across the spectrum, generating 360-degree profiles of hundreds of millions of users. Such data raises weighty privacy concerns—but for now it remains an asset that companies can monetize in relationships with advertisers and vendors, and through new products of their own. How to create a super-app for millions of consumers who have never even seen a credit card? Go-Jek and Grab have used the Internet and smartphones ingeniously to create armies of mobile tellers. Car and motorbike drivers collect cash and credit it to customers’ digital wallets. They toil alongside neighborhood agents who, in addition to topping up the wallets, help consumers who lack bank accounts purchase goods online, pay bills, buy insurance, or apply for loans. Go-Jek and Grab are dueling for customers in ¬arenas ranging from grocery delivery to medical advice. But the race in financial services has sparked a particularly frenzied burst of dealmaking. Go-Jek tends to prefer partnering through acquisitions, which allows tighter control. In Indonesia, for example, it bolstered its payments dominance in 2018 by acquiring three major financial services companies—an offline payments processor that works with retailers, a payment company that serves online merchants, and a saving and lending network that helps rural and working-class families buy household appliances—and merging the three into its Go-Pay system. Grab prefers partnerships and joint ventures, which enable it to reach more markets faster—and have helped Grab get an edge outside Indonesia. In October, Grab announced a partnership with Mastercard to issue prepaid cards that Grab customers can spend with any merchant that accepts Mastercard. Grab also has paired up with Japan’s Credit Saison to found Grab Financial Services, which now offers loans to unbanked customers—combining Grab’s data on consumer behavior with Credit Saison’s expertise in credit analysis. Grab suffered a setback in Indonesia last year when that country’s regulators barred ventures with more than 49% foreign ownership from offering digital wallets. But Grab worked around that restriction by acquiring Kudo, an Indonesian payment startup, and partnering with Ovo, a financial services firm owned by Indonesian conglomerate Lippo Group. Lippo’s shopping mall holdings give Ovo’s smartphone payment system an advantage at shopping centers and restaurant chains. Ovo’s users are also relatively affluent—allowing Grab to reach beyond the “base of the pyramid” that ¬Makarim and the Tans studied at Harvard. The rivals are also weathering more scrutiny from regulators. Singapore’s competition watchdog imposed fines of $9.5 million on Grab and Uber, ruling that their deal had eroded competition and driven fares up by as much as 15%. The regulator ordered Grab to restore its premerger pricing and told the service to remove exclusivity obligations on drivers and taxi fleets. This would seem to create opportunities for Go-Jek, which has committed $500 million to expanding in Singapore and other markets. But Go-Jek’s efforts to establish subsidiaries abroad have also met resistance. In the Philippines, for example, regulators have refused to license one Go-Jek business, citing restrictions on foreign ownership. Sometimes the upheaval in the industry manifests itself as actual unrest. In October a swarm of angry motorcycle drivers converged on the Lippo Building in downtown Jakarta. Protesters demanded the chance to present a minimum wage proposal to executives from Grab, whose local headquarters are in the building. Denied an audience, the crowd turned violent, smashing the windows of the front lobby, and police cleared the scene with tear gas. The scrum in Jakarta echoes the volatility of the markets in which Grab and Go-Jek compete—places where rapid growth and the rising expectations of workers and consumers combine to keep conditions at a rapid boil. The turmoil could conclude in a mega-merger in which one of the green-jacketed giants gobbles up the other. But many investors say they now see Southeast Asia’s super-app arena as a marketplace in which well-capitalized firms will settle into a long-term competitive standoff, alongside their myriad local partners. “The conventional view used to be that this is a winner-take-all market,” says David Katz of KKR, one of Go-Jek’s backers. “But no one thinks that now.” The race, in other words, has many laps to go.